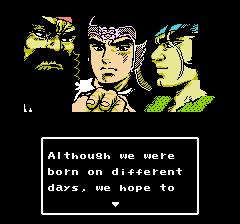 Destiny of an Emperor came out in 1989 in Japan, and was released in the US a year later. The publisher was Capcom, who didn’t do a lot of RPGs in the era, though they did release Sweet Home in 1989 (a interesting horror RPG.) Considering that the game came out in 1989, there’s some definitely old school elements to the game, but it does have some interesting ideas. Starting off with the story, Destiny of an Emperor is based off of the ancient novel, Romance of the Three Kingdoms. This book tells the story of warring kingdoms in ancient China, and heavily favors the kingdom of Shu. The military general and later emperor of Shu was a man named Liu Bei. In the game, you play as Liu Bei, rising in power along with his sworn brothers. A famous incident in the novel is the Peach Tree Garden Oath, where Liu Bei, Guan Yu, and Zhang Fei swore to die the same day and work for a peaceful empire. Much like a game based of of a show, games based off of the Romance of the Three Kingdoms tend to focus on the little details of the story. So, for example, Guan Yu has a “red face” in the book, and he tends to be depicted with a different skin tone in various games. 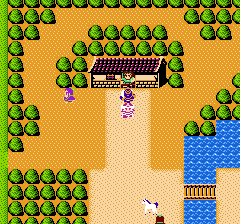 In the first town, the man to the south near the white horse will give you some free rations. Note the variety of tiles even if the graphics are very square and simple. The game starts with Liu Bei’s mother telling him about the Yellow Turban rebellion, and Liu Bei heads off to attempt to fight it. 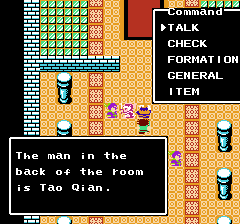 The game has pretty standard Dragon Quest style menus to talk to people, but there are some interesting features. Moving around items doesn’t kick you out of the items menu, which isn’t the most efficient method, but it’s better than some 1989 era games. The battle system uses soldiers for your HP, and you need rations to keep from losing soldiers as you walk around. You get 1,000 rations at the start of the game, and I ended up with 600 extra ones after doing some simple plot progression. Fighting basically involves using spells (situational combat tactics) and focusing your attacks. Common enemies can be killed using auto-battle techniques. Named generals get special music, and you can fight them while just walking around. You can have your attacks transfer from a dead enemy to another living one, which is a nice feature that doesn’t pop up often in 1989 era games. On the left, you can see the party, and on the right there are the enemy forces. The text is due to getting an ambush on the enemy. The game’s a little tough and unfair early on, but you only need three levels before you can pretty easily progress the plot. You do get a good feeling of a heroic destiny in the plot. For example, one person in an early town says that a prophecy says Liu Bei needs to kill the Five Tigers to rise to greatness. At the time, you are hunting down the generals called the Five Tigers. 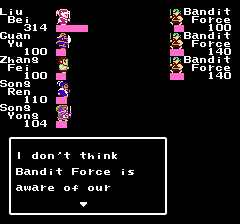 At the same time, you’re being offered a country if you can defeat the Yellow Scarf rebellion, you have townspeople being polite, and you can actually get an enemy general to defect to your side so you can use him to get a bridge lowered. It’s surprisingly effective at making you feel like you are important to the local politics. Note the different tiles used for the castle. It really does make it feel like this is a more rich and sumptuous building. Graphically, the game uses very square tiles, but there is a decent variety in them. The character sprites on your party members have enough variety that you can kind of tell which character is which, and you get fairly large character portraits in battle and in conversations. Musically, the game is pretty pleasant, and has a variety of tracks. In combat, you can get special battle music for named generals, and you get a tiny strip of terrain to show what the area is like. Some party members get yellow health bars to show that they fight especially well on certain types of terrain. Here, you can see the character portrait for Zhang Liang after a fight. All in all, Destiny of an Emperor is an ambitious game. It’s got some rough edges, but it’s pretty charming. The sequel feels like a remake (though it starts at a different point in the story.) I suspect a modern remake of the Destiny of an Emperor series would be pretty fun to play. Even now, I quite enjoyed exploring the game.